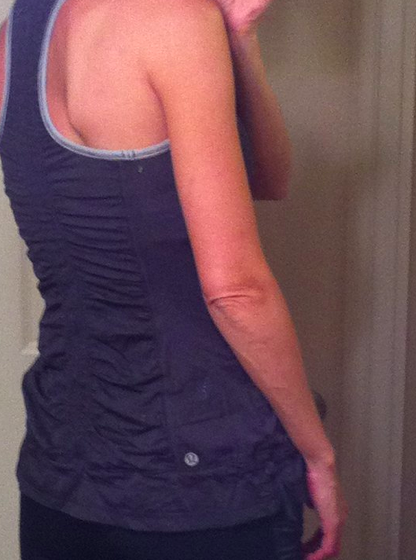 Reader Quincey provided fit pictures of the Energy SL in her true to size (regular tank size) and not sized down. 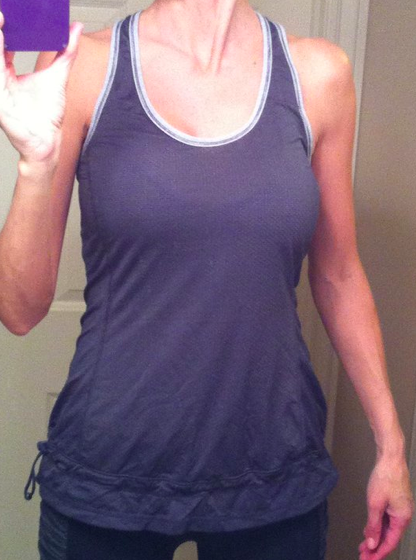 I tried this on yesterday in an 8 and found it really comfortable and looked like this one does around my tummy. My store had the tank in Toothpaste which I liked but didn’t love and Black. If I hadn’t gotten my Sing Floss Travel Jacket I would have liked to have gotten this tank in Coal. Kinda bananas that I opted for a hoodie on a hot summer day instead but I just loved the Navy Jacket on me and didn’t love any of the colors of the Energy. I hope we see a lot of color runs of the Energy SL this summer. I was just thinking i’d like to see thinking I’d like to see this in Pink Mist but I think it may be too late for that color. "Spotted: Sandra Bullock in Lululemon"